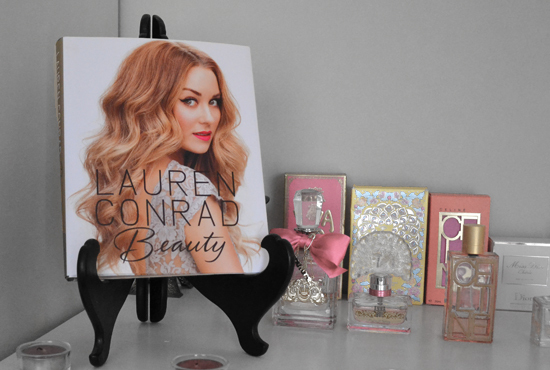 Lauren Conrad's 'Beauty' certainly does not disappoint, giving an insightful description of the world of beauty and what it should mean to us. The book is written and designed in the same format as her previous book 'Style', once again having a neat and elegant layout. However this time the content does not mention fashion, but focuses solely on physical aspects such as hair, skin, and makeup. Conrad has ensured that her readers recognise the emotional importance of feeling beautiful, emphasising that the beauty we're often faced with in the media is not real. She uses different models for the photographs in the book to show that everyone has a unique look and it's all about finding what suits you best, as "we define our own beautiful." Prep is the section that talks about taking care of your body and health, before you start adding things to it. It includes tips on skin care, hair care, fitness, and living a stress free life. This section also helps you to figure out what products and looks are good for you, based on your specific characteristics. Play is all about how to achieve different looks for every occasion. Here you'll find chapters on how to do multiple hair styles, braids, makeup looks, and even nail art. There is also a chapter detailing how to apply each type of makeup, what difference each makes, and the tools you'll need. This is perfect for beginners, but also helps experienced makeup users brush up on their knowledge. Finally Lauren ends the book with a chapter on the progression of beauty throughout history, reminding us that our look will always be transforming, so it's important to experiment and most of all have fun! One of my favourite things about 'Beauty' is the images that accompany the text. Each tutorial within the book has a photo for each step, a big improvement from 'Style'. If I had to choose between the two, I would say that 'Beauty' is slightly better due to the attention to detail, however I would highly recommend both! Love LC she is a very smart businesswoman on too of everything else! I'll have to check out this book!